Most economists believe that the current subrime crisis will have a spillover effect on the economy and will lead to a US slow down in GDP growth in the first quarter of 2 008. To understand at a very macro level on how this will impact China and India we must first visit the definition of GDP. GDP is defined as the value of the goods and services produced in a year for a country . 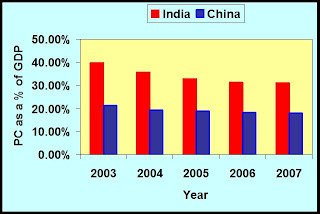 The first graph above denotes compares the personal consumption co mponent of the Total GDP of India and China . 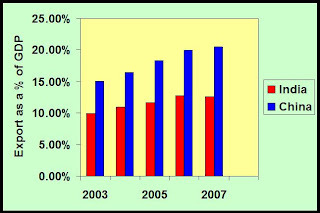 In 2007 , 31% of the GDP growth of India has come from personal consumption i.e people buying and selling services domestically, whereas China 's personal consumption share of GDP is a mere 18%. The bulk of the GDP growth for China comes from its exports which are almost 20% of the GDP while India's export component as a share of GDP is 12.76%. The other statistics are comparable and the only thing to note from the data is that India's share of Investment component of GDP has increased from lower levels to be comparable to those of China ( As a % of GDP). A slowdown in the US is going to decrease exports as the personal consumption in the US is going to fall. Since China is more exposed to exports than India a slow down in the US is going to impact China more than it will India.